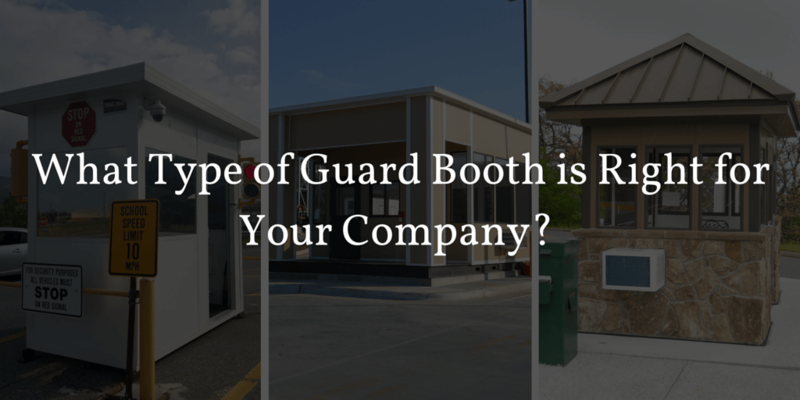 What Type of Guard Booth is Right for Your Company? 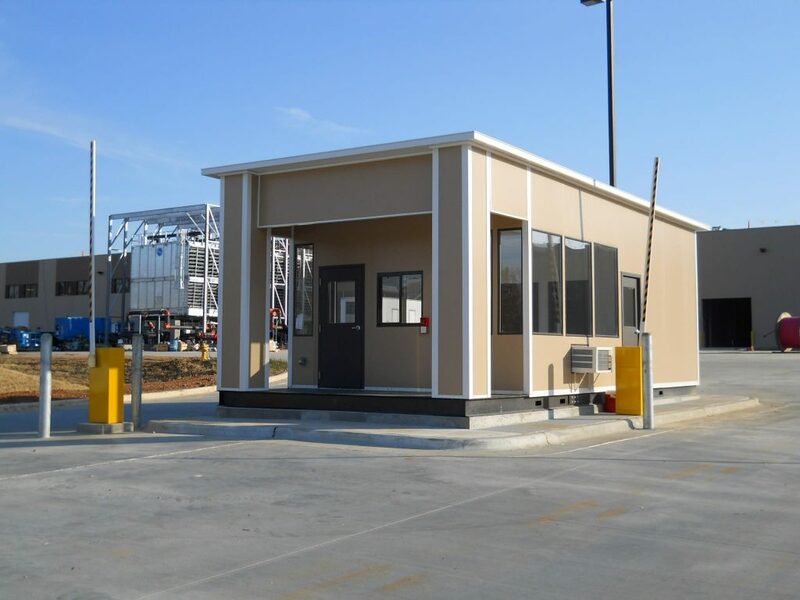 As company deciding what type of guard booth best fits you, you first need to ask yourself a few questions to decide the overall purpose and qualities of the booth. First, what purpose do you want the booth to serve? The booth could be made to specifically as a check point at the entrance of your property, or it could serve another purpose like an information kiosk or even a ticket booth. Answering this first question will allow you to understand what utilities you will want for the booth, and can even help you decide on the design of the booth. Second, decide how quickly you will need to have the booth up and running. The lead time for all of booths are relatively short, but certain designs can be put together quicker than others. And if urgency is key, we have the perfect solution for you. Third, consider the level of security that you would require from the guard booth. Obviously, certain companies have a higher threat risk than others. If you have reason to believe that your security officers need a higher level of protection, this should influence your decision heavily. Extra protection could keep equipment protected, but more importantly, it will keep your employees safe. For those of you who need your guard booths quickly and at a more affordable price, the quick ship guard booth will be the choice for you. We can construct this booth and send it to you within five business days, meaning your lead time will be a short as possible. However, that does not mean you will have to miss out on product specifications. Our quick ship booths still come with HVAC options to ensure your employees will be sufficiently warm or cool depending on the weather conditions. These booths also come with an electrical load center and a counter top to make for a nice work center for your security officer. These booths serve perfectly as toll booths, ticket booths, security checkpoints, and surveillance hub for your facility. Also, these units are mobile, allowing you the flexibility to move them from place to place depending on your needs. If you need a booth that will house more security officers or if you want a design that better fits in with your surrounding area, our custom guard booth option may be a better fit for you. The custom booth can come with a shed, gable, and hip roof in the color of your choice. Also, we can make them in practically any color that you desire and provide stone siding to enhance the aesthetic appeal of the structure. Although these booths can be made much bigger than our quick ship options, they can also be made mobile for maximum convenience for you. 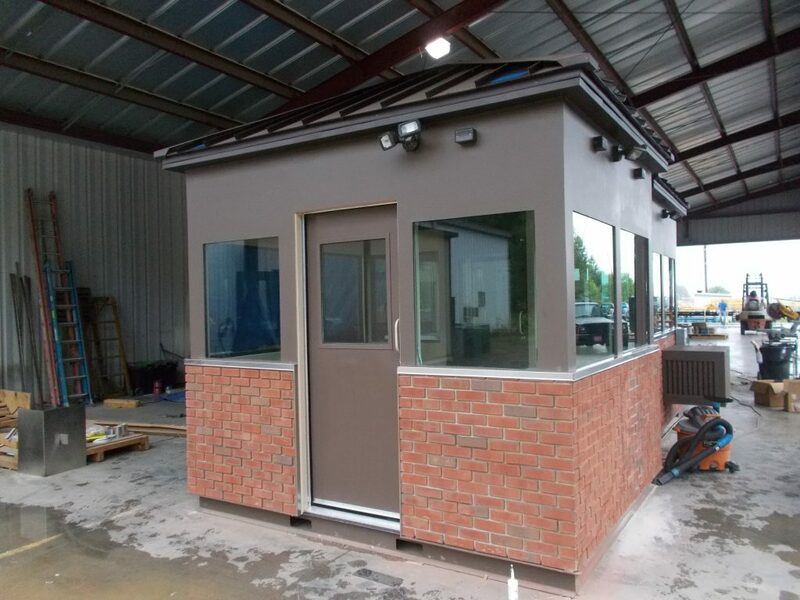 Most importantly, the custom guard booth allows you to include all the features you need in your exterior structure, like multiple work areas, a restroom, or a utility room. 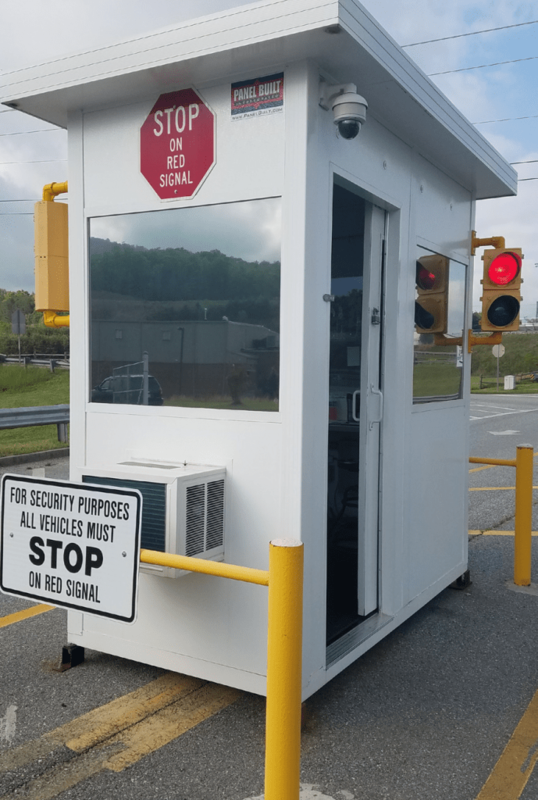 Finally, if you decided that security was the number one factor in your buying decision, look no further than our ballistic rated guard booths. These booths are also custom made, but are made from welded carbon steel or stainless steel to ensure maximum security for your employees. These booths have all been tested and rated to meet all levels of UL and NIJ protection. So if you think that your company carries a slightly higher risk than others our ballistic rated option gives you some peace of mind when it comes to your security. Plus, like our other custom models, they can be made in any color you would like and can be made to match the design of the other buildings in your complex. Get a Quote on the Guard Booth that’s Right for You!